Do you think fonts and screen text looks fuzzy, blurry, or excessively thin in macOS Mojave? If so, it may be due to changes in anti-aliasing in Mojave, particularly for users with non-retina displays. If you are running macOS Mojave on a Mac without a retina display, or with an external monitor that does not have an ultra-high resolution screen, you may have noticed that some fonts and text can appear as fuzzy, blurry, or excessively thin and difficult to read. Fortunately, with a little effort you can make some adjustments to how MacOS Mojave handles font smoothing and anti-aliasing which may improve the appearance of text and fonts on your Mac screen. We’ll show you a few tips on how to adjust font smoothing in MacOS to attempt to remedy any problematic font rendering or blurry text in macOS Mojave for non-retina displays. These font smoothing settings are not recommended to change on a Retina display Mac, though if you feel like doing so you certainly can experiment with the settings on a Retina Mac as well, if you do then please report your experiences in the comments below. We’ll cover three different methods of adjusting font smoothing and text anti-aliasing settings in macOS Mojave. The first is quite simple through a preference panel, but the latter options are more advanced and require using the Terminal. You can use any or all of them, and how each appears will differ depending on your particular Mac and the screens you use (and your personal preferences and perhaps eyesight). 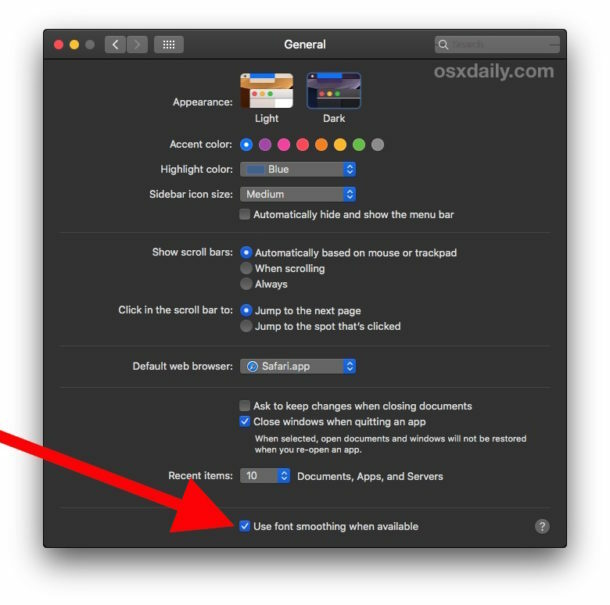 You might instantly see a difference in simply toggling that setting on or off, and that alone may resolve the issues you are experiencing with fonts in Mojave. If that settings adjustment is sufficient you likely won’t want to proceed further, however there are more tweaks and adjustments you can make to how macOS Mojave handles font smoothing and text anti-aliasing. If the above trick doesn’t resolve your blurry fuzzy fonts issue, then proceed with the more advanced tips further below to adjust how font smoothing works further. Again some Mac users may notice this change alone is sufficient to remedy any complaints they have about font blurriness, fuzziness, font weight or text being too thin or hard to read. But for some Mac users they still may have complaints, in which case you can also go further to manually adjust anti-aliasing settings in Mac OS. 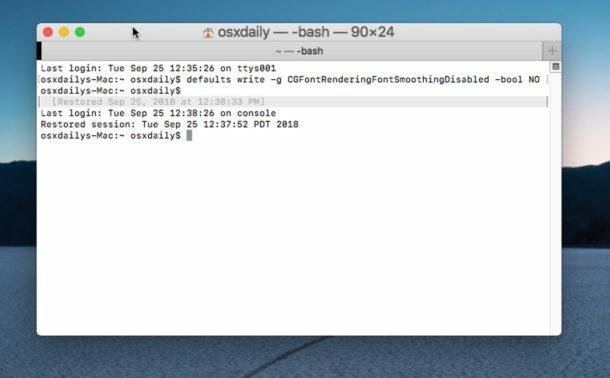 Next you can also manually attempt to change the strength of font smoothing settings (anti-aliasing) in Mac OS, this also relies on defaults commands entered into the Terminal. You will want to log out and back in again, or reboot the Mac, for the changes to take effect. How obvious or subtle the changes will be for you depends on your Mac, the display in use, and perhaps even individual preference and eyesight. Thus if you have any issue with the way fonts appear in macOS Mojave you might want to try each of the settings individually to find what works best for you. Again, restart the Mac or log out and back in again for the change to take effect. All of this may or may not apply to you and your particular Mac, screen, and display, but the cause (if this does apply to you) is apparently due to a change in how macOS Mojave handles font rendering and anti-aliasing. Variations of this tip have been covered here at OSXDaily.com many times before, in fact many users originally noticed way back in Snow Leopard that font smoothing settings had changed in Mac OS X then, and again later (and still relevant today) when a Mac screen sometimes looks blurry or fonts appear fuzzy, and yet again in Yosemite where font smoothing became an issue too, and here we are with macOS Mojave with a similar round of issues with fonts not looking quite right. These changes to font smoothing were first noticed during the beta period of Mojave, but persist today. Thanks to dev.to for the Mojave specific reference to this tip and the CGFontRenderingFontSmoothingDisabled defaults command string. Thanks. I just updated to Mojave and noticed that Times New Roman 12 pt. in Scrivener looks thicker and blacker, almost bold. It’s pretty ugly. I’m using an HP2511x monitor, so I’ll give some of the terminal commands a try. Turning off font smoothing in preferences looks slightly better, but a bit fuzzy. The OS X fonts on a Sony Triluminous LCD TV panel always look fuzzy due to the pixel element layout and use. If I use font-smoothing the fonts look better on a white background, if I turn it off they look better on a dark one. Windows used to have a font optimizer that one can run and be presented with various font rendering options, so they can pick the one that looks best on the particular display. OS X needs something like that. Update: Used the first command (defaults write -g CGFontRenderingFontSmoothingDisabled -bool NO) and text looks significantly better. Thanks again. Thanks! I guess this means Apple will soon only sell retina displays for Mac? I use an external monitor so even if that is the case I will continue to have several great HD external monitors to use moving forward, these tips will be handy then too. Yes! This worked perfect for me as well. I am running a retina MacBook Pro through an Apple Thunderbolt display and everything is nice n’ crisp. Thank you!!! Same! Back to the same setting as on High Sierra (on Apple Thunderbolt Display). Not sure how that happened, thanks for the correction! They have been fixed. You’re correct, the use of ‘read’ is to see the value, while ‘write’ is used to change the value, and ‘delete’ is used to remove it. I use an Asus monitor on my Mac mini Late 2012. Now everything looks much better. Asus monitor on Mac ? How it is? I personally use an ASUS 24″ monitor connected to a MacBook Pro and it looks great. 1920×1080 resolution. But one thing I have found to be helpful is to use a slightly darker display gamma to increase the contrast of fonts on the screen, which works for me but may not be doable for users who require perfect color accuracy. I have a Thunderbolt Display and “defaults write -g CGFontRenderingFontSmoothingDisabled -bool NO” did such a good job I think it looks better than OS X 10.13! I already had “Use font smoothing when available” selected. I was finding reading system font in mail app and news app on my MacBook Air. Used the terminal input suggested and what a huge difference. Thank you. Thanks, the first terminal option fixed it. the new update make the old macbook air’s screen flurry. I guess the best way is roll back to macos High Sierria..
the text is clear on that os version..
thanks for this! Thought I was going blind. BTW in my general tab under preferences, there was no choice for font smoothing. But the second tip did the trick. I’m having problems keeping my computer from uploading everything to the cloud and not leaving it on the computer.